Getting to Mal Pais is half the fun and a beautiful ride... the journey is the reward. First off you get on Highway Route 27 from San Jose towards Puntarenas and catch the Ferry to PAQUERA. The drive to PUNTARENAS is approximaltely 1.5 hours. It's a toll highway which should end up running you about $5.00 max. Look at the map below, it illustartes well how to get to the ferry from San Jose airport. Depending on the car you rented the ferry ride will set you back no more than $40. You'll receive a ticket from the ferry attendant which you take to the ticket booth. Just ask where the ticket booth is and pay for the vehicle and a ticket for each passenger. The ferry the ride is approx 1.5 hour long across the the Gulf of Nicoya. Beautiful! 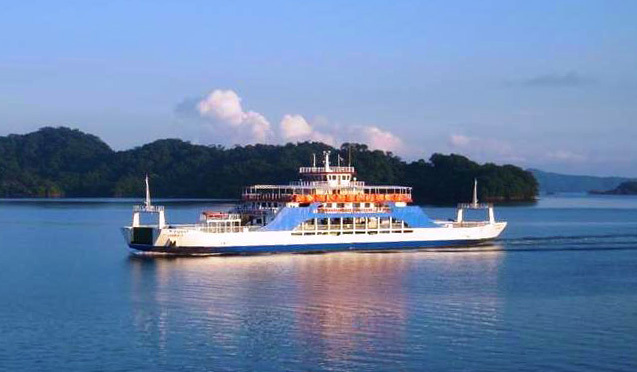 The Naviera Tambor Ferry crossing the Gulf Of Nicoya. Schedules available on their website. Directions from THE Ferry Dock At Playa Relleno, PAquera to Mal Pais. Now The Fun Begins! Once you've arrivedat Paquera you will drive approximately 1 hour to COBANO. There are a few road signs along the way, the road twist and turns but it's pretty straight forward to get to Cobano. From Cobano to Mal Pais it's another 15km. Approximately 1.5km after you leave Cobano you'll reach an intersection with a road sign, you want to make a left hand turn, towards Mal Pais. At this point the road will have parts of it paved and others will be gravel. This will lead you straight to the Mal Pais / Santa Teresa intersection. You want to make a left hand turn and drive for another 3.5km, look for Mary's Restaurant on your left hand side (you can ask around, everyone knows where is Mary's Restaurant). Once you pass Mary's Restaurant make the first left hand turn, this is the Mal Pais to Cabuya Rd. After turning left you want to take the first right hand turn through an open metal gate, this road is called Calle Lailas. The entrance to the property will be on your left about 200 meters down this small road, it's does sor on an S-curve along the way and you'll see a wooden fence along the property. There is a much faster way to get to us, by taking a domestic flight from San Jose to Tambor. The flights run approximately $120 each way. There are several airlines that have daily scheduled flights. You can check visit their websites for rates and departure times or call them directly. Once you land in Tambor we can arrange a rental car or shuttle service. Nature Air offers a 20 minute domestic flights from San Jose International Airport to Tambor several time a day. If you want door to door shuttle service from either San Jose or Liberia International airport to our property, just let us know. We would be more than happy to set that up for you.